Don Miguel Ruiz' teachings and bodies of work encourages and uplifts the spirit of humanity to embolden living a life free of conflict with self, loving self, expressing self, and respecting self. What an absolute honour and pleasure it was for me to interview Don Miguel Ruiz Jr., on Living Fearlessly with Lisa McDonald! It warms my heart immensely whenever I am afforded the opportunity to publicly thank my intangible mentors via my global platforms…publicly thanking each of them for significantly expanding me, consciously, as a fellow human being. There is no greater gift to receive than the gift of someone empowering you to empower yourself so as to be the best, most integral version of yourself; additionally gifting you with their generously shared tools, wisdom, and profound insights. Don Miguel Ruiz Jr., talked openly and very candidly on a whole myriad of subject matters including his relationship with his father, Don Miguel Ruiz Sr., author of The Four Agreements, and co-author of The Fifth Agreement. I respect and admire Don Miguel for how refreshingly real he was on the airwaves with myself, my loyal listeners, and the podcast subscribers. Although, Don Miguel Jr., is an extremely enlightened, self-actualized human being…he openly acknowledged his idiosyncrasies and missteps within his own journey. When my guests happen to be of household, global stature, I make it a point to publicly acknowledge how much I personally appreciate the sharing of the backstory of their struggles, adversity, and hardships. Their vulnerability, and forthcomingness of the ‘real’ story as compared to the discussion of the ‘overnight’ success story, the accolades, and momentous lifetime achievements is the reinforced message for which I prefer my listeners to hear. My number one priority as a show host is always to honour and deliver on what I know most resonates with the Living Fearlessly with Lisa McDonald listeners. The more relatable and humanized my guest, the more probable the intended message of Living Fearlessly, will land; precipitating a pivotal shift in elevating the conscious awareness of/for the collective. Don Miguel fully delivered on this front for which I am immensely grateful! The Fifth Agreement is a beautiful follow up to The Four Agreements, which sold millions of copies worldwide. As a result of the underlying message within these two books of LEARNED practices of ‘Agreements’ involving needless suffering and cause for how we have turned against ourselves; millions of lives have been completely transformed in the redefining of ‘Agreements’ and for what healthy ‘Agreements’ should embody from the perspective of awareness and application. With there now being five Agreements cited by these authors, I invite you to listen to Don Miguel’s answer when I asked him what he considered to be the most important Agreement of them all. I have duplicate copies of both these books and have read; reread them very thoughtfully, throughout various junctures within my own journey. No coincidence (as I consistently say) to these books having been on my shelves and instrumental in my life… many years before ever personally interviewing Don Miguel Ruiz Jr. No coincidence that the core messaging within both of these books is predicated on what is essential and in full alignment for one who truly subscribes to what it means to show up in every single day life with the commitment of being the best, most improved version of self. The Fifth Agreement provides the core essential ingredients for how to achieve and master exactly that! For anyone wishing to free themselves; liberate themselves; emancipate themselves from the underpinnings of carrying what other people think of you – and at the cost of you being more focused and committed to what you think of yourself and you being in alignment with the inner you, first and foremost…I cannot emphasize adequately enough how profoundly, The Fifth Agreements will transcend these type of struggles (which many people encounter and feel conflicted by) into integral living with newfound clarity and purpose. What a gift! Anyone on the face of this planet whose teachings and bodies of work encourages and uplifts the spirit of humanity to embolden living a life free of conflict with self, loving self, expressing self, respecting self… is a pure gem in my eyes. Life is too precious and too fleeting to remain resistant to living a joy-filled, purpose-driven life. Purging ourselves of the false beliefs, false concepts, old non-serving scripts, clinging to shame, guilt, and regrets is so passe, so weathered, so outdated, and beyond counter-intuitive. Living in the past, mentally beating yourself up or buying into someone else’s version, or ideology, or belief system for who you are or who you should be is beyond ridiculous. The purpose of each of us being born with our own individual brain was not with the intention of us to be co-opted, coerced, brainwashed, manipulated or usurped. Our capabilities and (unlimited) potential does not reside in the opinions, decision-making, or judgements of others. Why are we as a people obsessed with repeatedly trying to convince ourselves of false truths, which are crippling our spirits, and eroding our inner confidence? Who are you handing your personal power over to and why? What are you personally getting out of that dynamic that keeps you going back for more of the same? ENOUGH! NO MORE! The world needs each of us operating at our highest vibrational level. The culture of humanity as a whole is begging each of us to level up and to play a bigger, healthier game so that it can only ever be a win win scenario for the collective. Loathing ourselves is not the answer. Disrespecting ourselves will never be the solution. Remaining invisible and silent should never be an option. Living in a perpetual state of fear should never be negotiable. Feeling ‘less than’ is garbage. Come On Friends, we can all do so much better than this! I know it and you know it. You have to believe it to see it! It is a choice! Let us all choose better. Let us all be better. Let us all do better. Let us all feel better. Let us all believe better. Let us all love better. Let us all embrace The Agreements! 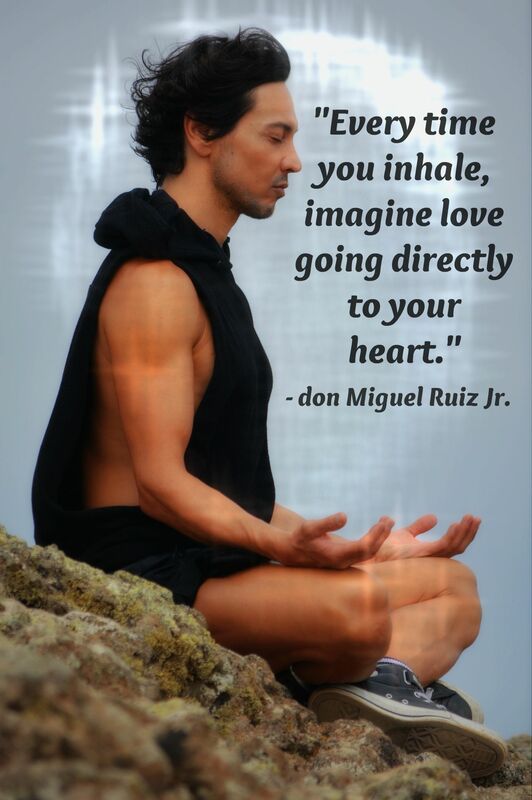 Love and Gratitude to you our friend, Don Miguel Ruiz! Keep Shining!